This building is listed as an "Art Department Building" which "...consists of 7 individual units. 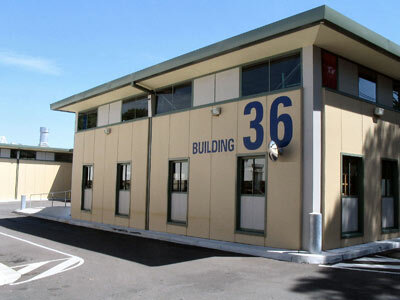 Some units have upstairs office areas providing productions with maximum flexibility. 2,760sqm 29,700sqft". It should be noted that this appears to be the only independent site inspection that has been made in any way public, and that this assessment occurred prior to the current building 34 being built on the site of the old Kurrajong Pavilion. NOTE: Because precise inventories cannot be obtained all of the chemicals, materials and processes that are routinely used in film production have been provided here. This list was provided to the NSW Department of Planning by the management of Fox Studios Australia. Please note that there is no monitoring in place for the abovenamed substances.